As the name implies, for that I will need some sort of scoring, but I will discuss that later (technically, I’m working on the two features in parallel, but I will separate the blog posts). For now, I want to get rid of any predictable bad layouts that I can reliably “clean up”. And then I can re-run the generation if any of the failed steps requests a restart. I should rarely see such a restart and pretty much never see multiple in a row. 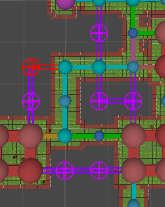 I only remove a single node, so these can leave behind a dead-end. But the dead-end removal step would get rid of those, so it’s fine. And the transforms took probably another amount of writing a custom rule. In total, this took the time to write something like four new hard-coded rules. So that means that the fifth pattern I encode for adjustment is going to be faster than if I had hard-coded them all. Efficiency! And I also have to account for the fact that I would be royally tired of hard-coding finicky cases by that point. In contrast, this was actually fun! The best part is that the patterns are “hard-coded” and thus make sense. I’m also surprised by just how often these patterns match. I guess part of the reason is because everything is so tightly packed, it’s inevitable that I get a lot of repeating patterns. But I also usually notice the problems only when they are more or less obvious. But with patterns, it will match them even if I were to glance over it. Occasionally, I look at something that was adjusted and go, “oh, yeah, that does actually match”. Which is a good thing — it’s “smarter” than me at detecting patterns. It’s near impossible for me to design patterns than never do this — they will. So the best I can do is just stop iterating after a few runs and call it “good enough”. In fact, I can count this as a step failure. This doesn’t happen often — may be 2/300 individual dungeon generations. It still only takes 500 ms for 30 iterations. But the bottom line is that these happen and I need a safety termination for the potentially endless loop. 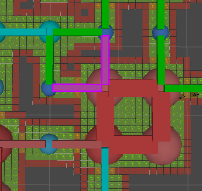 None of my patterns break gameplay (the layout was technically playable before). 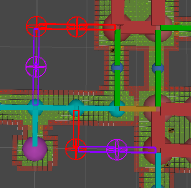 So that about wraps it up: I can now prevent arbitrary (small) layout issues easily whenever I see them. This will make my next task — scoring — significantly easier since I don’t have to worry about these cases that I can just fix before they ever get scored.